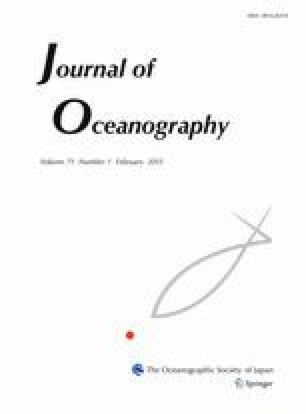 Size-fractionated primary production was investigated in the Kuroshio Extension (KE) and adjacent regions from winter to spring in order to understand dynamics of spring phytoplankton bloom. Primary production in both the Kuroshio and KE regions was low in winter and ranged from 61 to 185 mg C m−2 day−1, and was composed mostly of small phytoplankton (<10 µm). While large phytoplankton (>10 µm) became major producers in spring with high production of 443–871 mg C m−2 day−1 in the Kuroshio region, the main primary producers remained small in the KE region, and primary production was not elevated as observed in the Kuroshio, ranging from 82 to 492 mg C m−2 day−1. Low production in the KE region in spring was associated with a lack of primary production by large phytoplankton, and this was primarily due to the low availability of nitrate and silicic acid in early spring. Within the KE region, primary production tended to be high in the northern edge and around the axis of the first ridge of the KE meandering compared with other regions of KE. The shoaling of the surface mixed layer produced by intrusion of the southern warmer water was responsible for the high primary productivity. We thank the captains, crew members and scientists on board the cruises of R/V Wakataka-Maru, Soyo-Maru, Hakuho-Maru, and Tansei-Maru for the cooperation at the sea. We also thank M. Nakamachi and T. Ikeya for chlorophyll a and nutrients data, and K. Hayashizaki for his cooperation in mass spectrometry. This study was financially supported by the grant ‘Studies on Prediction and Application of Fish Species Alternation’ (SUPRFISH) from the Research Development of Agriculture Forestry and Fisheries Research Council, and a MEXT grant (24121005).